On October 1, eight teachers from Taito-Ward Junior High Schools visited our Institute to observe the businesses and facilities of the Institute in order to make use of what they learned in their teaching. They toured the Japan Center for International Cooperation in Conservation on the fourth floor, the Restoration Studio of the Center for Conservation Science and Restoration Techniques on the third floor, the X-ray Room of the Center for Conservation Science and Restoration Techniques and the Audio-Visual Documentation Section of the Department of Intangible Cultural Heritage on the basement floor; and the Library of the Department of Research Programming on the second floor. Those in charge of each facility provided explanations and answered questions. On October 5, 23 members of the Nana-ichi Society visited the Institute to see and hear the actual conditions of conservation/restoration and increase their awareness on the importance of inheritance of cultural properties. After listening to an overview given by Mr. Ide of the Planning and Liaison Section, they viewed the panel exhibition on the 1th floor and toured the Restoration Studio of the Center for Conservation Science and Restoration Techniques on the third floor, the Audio-Visual Documentation Section of the Department of Intangible Cultural Heritage and the X-ray Room of the Center for Conservation Science and Restoration Techniques on the basement floor. Those in charge of each facility provided explanations and answered questions. On October 31, the National Research Institute for Cultural Properties, Tokyo exhibited panels at the school festival of Ueno Junior High School in Taito City, Tokyo. We displayed two subjects: Wall Paintings of Kitora Tumulus: Removal of Wall Paintings and Restoration Work and Restoration of Screens Illustrating Views of Kyoto and its Environs (owned by Royal Ontario Museum, Canada): 2006 Program for the Conservation of Japanese Art Objects Overseas. The panels previously exhibited at the entrance of the Institute were reused. At the exhibition on the removal and restoration of Kitora Tumuli mural paintings, however, we also displayed the tools used for the restoration work, such as a diamond wire-saw, spatulas and work clothes, and screened a recorded video of mural painting removal. The panels exhibited at the entrance of the Institute have never been displayed outside the Institute before. Although the exhibition was on display for only one day, approximately 400 Ueno Junior High School students, teachers, and guardians were able to view the panels. 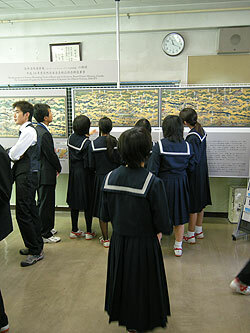 The Kitora Tumuli mural paintings have frequently been covered by media in recent years, and the Screens Illustrating Views of Kyoto and its Environs have frequently been issued on schoolbooks of social studies as a pictorial cut, so these cultural properties might be familiar for the students at the Ueno Junior High School. We think it was a good opportunity for people to realize that a research institute that conserves the cultural properties and hands them down is located close to Ueno Junior High School. This year, the National Research Institute for Cultural Properties, Tokyo published a brochure for children entitled What’s the National Research Institute for Cultural Properties, Tokyo? The aim of this brochure is to introduce the Institute to elementary school children and junior high school students. When compared to the 2008’s edition, the format of the 2009’s edition was changed to B5, the number of pages to 16, and the content has been changed so that the activities of the Institute are introduced as topics. 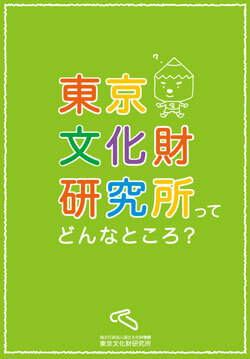 This brochure is scheduled to be distributed to public elementary and junior high school students in Taito City. 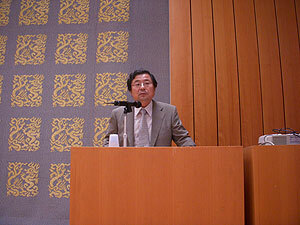 Of course, they are also available for visitors at the Institute and at Kuroda Memorial Hall. The Institute holds a public lecture every autumn in order to disclose the results of our research on art history. This public lecture is the 43rd with the first held in 1966. Since 2006, we have established a common theme titled “The Dynamics of Interaction between Objects and People”, and four researchers from both within and outside the Institute gave presentations on October 2nd and 3rd. 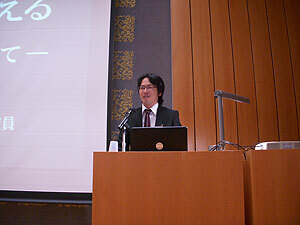 On October 2nd, Tsuchiya Takahiro, a researcher in the Department of Research Programming of the Institute, presented a lecture titled “Creating a ‘foreign country’: A Study of the Genjo Sanzo-e”, and Mr. Tsukamoto Maromitsu, a curator of The Museum Yamatobunkakan , presented a lecture titled “Japanese Buddhist Monk Viewed from the Song Dynasty: Buddhism/Land and the World of Exchange of Cultivated Things”: They intended to dig into how Japan in medieval times and China during the Song Dynasty viewed and recognized each other, using a picture scroll from the Kamakura Period, the transfer/exchange of cultivated things in the eastern Asia, and the social context of the time. 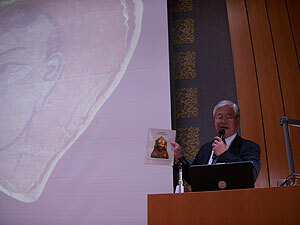 On October 3, Nakano Teruo, the Deputy Director General of the Institute, gave a lecture titled “Optical Investigation of Central Asian Mural Paintings Brought Back by the Ohtani Mission”and Mr. Shirasu Joushin, lecturer at Hiroshima University, had a lecture called “The Tibet Ohtani Mission and the Tibetan Religious World”. They tried to reevaluate the works discovered by the Ohtani mission from the viewpoint of art history based on recent optical investigation, and reviewed the responses of Japan, England, China and Russia concerning the activities of the Ohtani mission at that time. These four individuals’ presentations reexamined the relationship of Asia to Japan in respective pre-modern and modern periods from the viewpoint of the broad effects and actions of goods, art objects, cultivated things and cultural properties, and the various activities of the people related to those goods. They were well suited to the common theme of The Dynamics of Interaction between Objects and People and were very exciting. The audience on these two days number totals of 133 and 125 people respectively, and questionnaires taken on both days showed that the lectures satisfied many people. We would like to continue disseminating the Institute’s research results in the future. 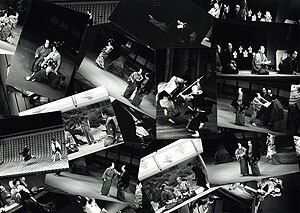 The Department of Intangible Cultural Heritage is proceeding with arranging Kabuki photos taken by Mr. Umemura Yutaka and donated in autumn 2007. The photos include snapshots of actor interviews in 1955 and later as well as the photos of backstage staff. They are highly valuable materials for studying the history of performance art. The arrangement of these materials started in 2008, and some of the achievements were reported in Volume No. 3 of the Study Report on Intangible Cultural Heritageas an introduction of materials. Because the number of photos is enormous, we are now currently focusing on the photos of Kabuki actors playing on stage, and proceeding with arrangements, while confirming the performance dates and actors chronologically. We have arranged 1,041 photos as of this October, and will complete the arrangements of monochrome stage photos in the Showa 30s (1955-1964) within this year, together with the work finished in the previous year and shown in the above-mentioned report. For three days starting October 17, the above-mentioned conference, in which researchers engaged in conservation of cultural heritages in Japan, China, and South Korea announce their latest achievements, was held at the Palace Museum in Beijing. Mr. Ishizaki Takeshi, the Director of the Center for Conservation Science and Restoration Techniques, was invited to give a lecture on the deterioration of stone buildings in cold districts; Mr. Morii Masayuki, a researcher at the Center, made a poster presentation on the nondestructive deterioration research of ignimbrite; and Yoshida Naoto, a senior researcher of the Center also made a poster presentation on research into the state of mural paintings of the Takamatsuzuka Tumulus. Many researchers from other Japanese organizations also participated in this conference and had active discussions with researchers from the other countries. Because three countries have historically deep relations, there are also many common points in cultures between them. On the other hand, there are many differences in thinking in terms of the conservation of cultural heritage. How those of us living in a large cultural area have common recognition and cooperate with each other will greatly depend on the future prosperity of this academic conference. 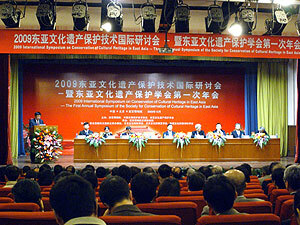 The announcement stated the plan for the next conference to take place again in China two years after. The Center for Conservation Science and Restoration Techniques conducted an international course on the Conservation of Japanese Lacquer Works from September 17 to October 15. 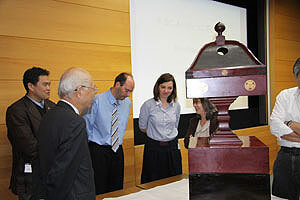 This course on conservation was a training program performed independently by the center, following on the heels of the International Course on the Conservation of Japanese Lacquer that we previously jointly held with ICCROM (International Centre for the Study of the Preservation and Restoration of Cultural Property). For this training session, we selected a few restoration specialists among the trainees who learned the basics of the Japanese urushi culture through the Conservation of Japanese Lacquer, which lasted for two weeks, and implemented hands-on training on restoration for one month using actual lacquerware work as educational material. Two individuals – Mr. Gasner Adda from the Herzog Anton Ulrich-Museum in Germany and Mr. Barash Lentz from the Hungarian National Museum – received hands-on training from Mr. Yamashita Yoshihiko, a lacquerware work restoration specialist. They made a tour to observeurushi cultural heritage in Himeji, Kobe, and Nara from September 21 to 23, and on October 5, they visited Jissouji Temple in Minato City, Tokyo, which offered educational material (one of the Aizu region’s Matsudaira Family’s temples in Edo during the Edo Period) and looked on the lacquerware work, including the actual daimyo’s tools. They concluded their training with presentations on what they had learned. The educational material used in this training was a vermilion-lacquered jokoban (incense clock) with goldmitsuba-aoi emblem which was very dirty and damaged (the Aizu Matsudaira Family’s fixtures and furniture from around the late Edo Period). We borrowed this piece and brought it into the restoration studio in the Center for Conservation Science and Restoration Techniques, and the trainees experienced a series of operations: preliminary research, photographing, scientific analysis, curing, cleaning, and attachment of urushi coated film and damaged portions using traditional restoration materials such as lacquer and glue. They had a high awareness of issues and were very enthusiastic because they were to become restoration specialists engaged in conserving and restoring the lacquerware works in their own art galleries and museums in the future. We finished the restoration of the jokoban, which was seriously damaged and could not be moved until then, as an emergency measure which was possible in a short period of just one month. 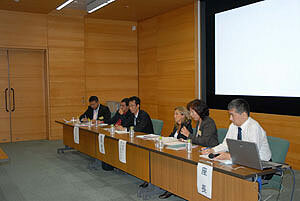 It will be designated as a cultural heritage of Minato City, Tokyo at the end of the year. 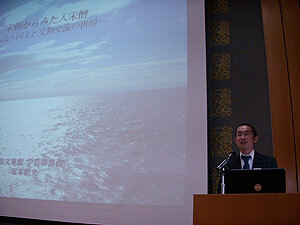 On October 27, 2009, the East Asian Cultural Heritage Forum was held in Seoul, Korea, and from the National Research Institute for Cultural Properties, Tokyo, the Director, Mr. Suzuki Norio, Mr. Okada Ken, the Head of Project Planning/Conservation Systems Section at the Japan Center for International Cooperation in Conservation, and MORII Masayuki, a researcher at the Center for Conservation Science and Restoration Techniques, attended the forum. This forum was part of the events commemorating the 40th year of the foundation of the National Research Institute of Cultural Heritage, Korea. The directors of research organizations in Japan, China, Mongolia, and far-eastern Russia, which are conducting joint research with the Korean Institute, gathered in a hall and discussed the future of international joint research on the conservation of cultural heritage. 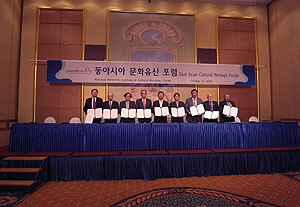 As a result of the discussions, they agreed to make efforts to build a network of research organizations and jointly foster human resources based on the mutual understanding of characteristics that the cultural heritages of participating countries have, and jointly announced and signed the “Seoul Declaration (concerning the conservation of cultural heritages in East Asia)”. 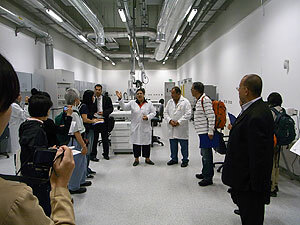 The project of fostering experts in conservation laboratories of Iraq National Museum has been conducted since 2004 with funding from grants from the Institute and UNESCO/Japanese Funds-in-Trust. Through this project, the Japan Center for International Cooperation in Conservation has invited total 18 conservation experts as trainees, and trainees who have returned to their home countries are making use of the techniques they learned in restoring various cultural properties. In pevious training sessions, the trainees have practiced using the equipment offered to the museum, centering on metalware, with the cooperation of various organizations in Japan. This year, we conducted training on the conservation and restoration of dyed textiles, and using the instruments necessary to conserve and restore cultural heritage and analyze materials (training on equipment use), in line with the wishes of UNESCO and the Iraq National Museum. Although it was a relatively short period of three months from June 18 to September 19, we not only conducted training on conservation and restoration techniques, but introduced lectures on the concept of conservation that informs the techniques and on diverse scientific knowledge, as well as practical training aimed at fostering human resources who can train specialists at each museum rather than just simple restoration experts. The training was carried out with the cooperation of university researchers, who took the lead of conservation and analysis of dyed textiles, as well as conservation/restoration experts. At the Shizuoka Research Institute for Buried Cultural Heritage, the trainees learned how to conserve archeological relics, treat unearthed objects at an excavation site, and handle items buried at actual sites. In terms of practical training on the conservation and restoration of dyed textiles, we asked professors specialized in the basics of conservation and the history of dyed textiles to give basic lectures on their specialties, and the trainees had practical training on conservation/restoration and storage management of the short-sleeved kimono of the Edo Period and the Coptic textiles owned by Joshibi University of Art and Design with the cooperation of the university. 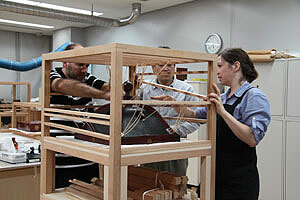 The trainees also attended lectures on the usage of various instruments and analytical techniques as well as practical training with the cooperation of the Center for Conservation Science and Restoration Techniques of the Institute and the Nara National Research Institute for Cultural Properties. In January 2009, some exhibitions restarted in the Iraq National Museum. So far, one-third of the cultural properties which were lost during the chaos in Iraq have been returned to the Museum, and they are now gradually but securely advancing toward restoration. We are looking forward to seeing the conservation specialists who participated in this training bear the future of the Museum and contribute to Iraq’s recovery. From October 23 to 28, we held a workshop titled “2009 Conservation and Restoration of Murals unearthed in Central Asia” at the National Museum of Antiquities, Tajikistan. This workshop took place as part of a project for the conservation and restoration of mural pieces owned by the National Museum of Antiquities, Tajikistan. 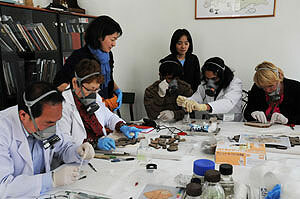 The National Research Institute for Cultural Properties, Tokyo has been working on together with the Institute of History, Archaeology and Ethnography, Academy of Science, Tajikistan, under the framework of Networking Core Centres for International Cooperation on Conservation of Cultural Heritage funded by the Agency for Cultural Affairs. This was the second such workshop held, following a similar one held last year. This year, in addition to the three experts from the Central Asian countries (Kazakhstan, Kyrgyz and Turkmenistan), we invited two experts from the Mural Restoration Laboratories of The State Hermitage Museum, Russia, and one expert from the DunHuang Academy. 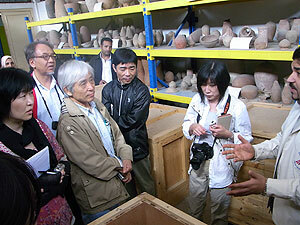 Six trainees from the National Museum of Antiquities, Tajikistan also participated in the workshop. At the workshop, the Russian restoration specialists reported on the method of restoring murals unearthed from the Central Asia executed in the former Soviet Union, and other participants reported on conservation/restoration activities in their own countries. We introduced restoration/conservation methods currently being employed in Tajikistan, and asked participants to experience part of the actual works. We will hold the similar workshops in the future with the aim of promoting mural restoration/conservation activities in Central Asia and improving restoration/conservation methods. The 23rd Conference on International Cooperation on Conservation titled “Why have Sites Remained?” was held on October 8, with 43 participants. When considering site conservation, damaged sections are generally investigated and the cause of the deterioration is studied. At this conference, however, we selected well-conserved sites, examined why they have remained undamaged, and aimed to consider the conservation of damaged sites going forward. Three presentations were made and overall discussions were held: Ms. Paola Virgili from the Rome Cultural Heritage Preservation Bureau, Italy presented “Augustus Pantheon and Hadrian’s Pantheon: Studies, digs, research and diagnosis for future conservation and prevention”, Mr. Harada Masahiro from the Tottori Buried Cultural Property Center presented “Conservation Environment of Aoyakamijichi Site”, and Mr. Cecep Eka Permana from the University of Indonesia presented “Rock art in South Sulawesi, Indonesia”. Conference participants understood the background and scientific conditions for site survival, and shared useful information for future site conservation. The Japan Center for International Cooperation in Conservation continues to provide technical support for the establishment and operation of the Conservation Center which is an affiliated organization of the Grand Egyptian Museum, as requested by the Japan International Cooperation Agency (JICA). We dispatched a mission of 10 Japanese experts in conservation/restoration and storage/management and two of the Institute’s staff members to Egypt for preliminary investigation from October 26 to November 14 at the longest (schedule differs depending on specialty field in charge). The purpose of this mission is to establish a plan of fostering human resources in the full-scale cooperation stage, Phase II (second stage), which is to start in April, 2010. During this period, we visited the Conservation Center of Grand Egyptian Museum twice, had repeated discussions with the executives of the project on the Egyptian side and the restoration specialists who were proceeding with the preparations at the local site, and learned about the progress of the establishment of the Center. Also, we had an opportunity to visit the repository of the Museum to which the cultural properties are to be moved and talk with the restoration specialists, and learned about the current situation of conservation/restoration of cultural properties in Egypt. Based on the results of this investigation, we will summarize the human resource fostering plan established by an expert, and submit it to Egypt through JICA. We will promote further cooperation toward the establishment and operation of the Center.